Yup, that boring white stuff. Add water, cook, eat. Heck, if you buy instant rice, or rice in a bag, I’m not even sure you cook it these days. Maybe trendy home cooks have gotten into the more exotic varieties. I confess, I currently have jasmine, Arborio, Basmati, red, black, and brown rice in my pantry. Yes, I’ve cooked with them all. But recently I saw a recipe in the New York Times Sunday magazine that surprised me. It seems there is something else you can do with rice. Who knew? 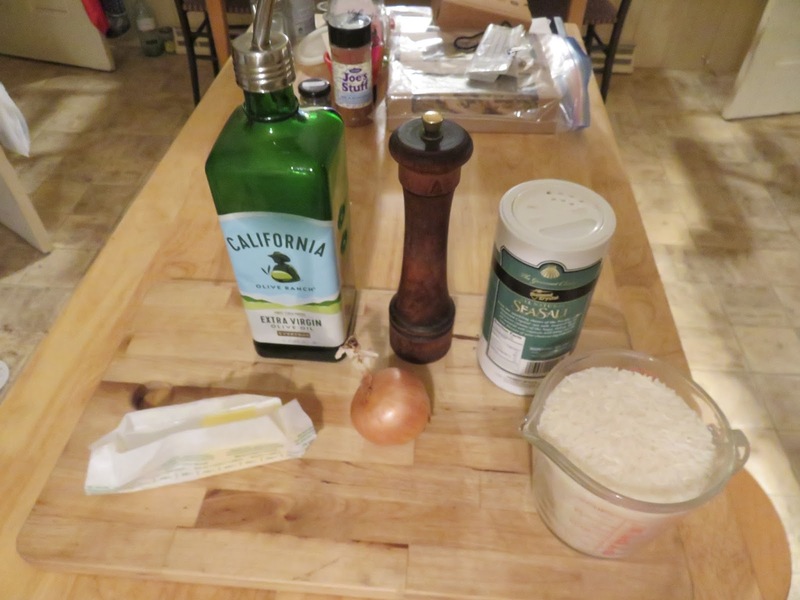 The author presented this in the context of a bigger recipe involving chicken, but it occurred to me that the rice part could stand alone quite nicely as a side dish for any number of other things. So I figured, why not try it? Warning: this is kind of labor-intensive for a side dish (mainly because you spend a lot of time stirring and waiting), especially if you’re in a hurry to get dinner on the table. Maybe you can use it to jazz up some leftovers, if you have the time. But hey, there's a blizzard today, so I might as well stir! 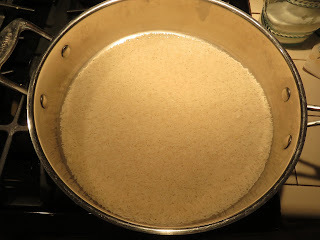 Add the plain rice (not rinsed—it has to be dry for this to work) to a dry sautee pan over medium-high heat and “dry-roast” it, stirring slowly and steadily until the rice turns golden and released a fragrant odor. This will take about 15 minutes (watch it carefully so it doesn’t burn!). 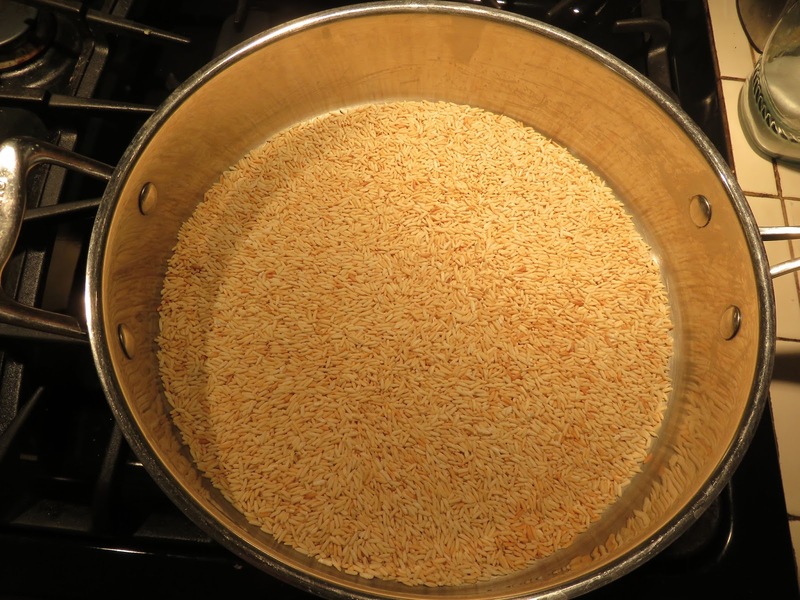 Remove the rice from the heat and let it cool (which will take a while—it’s hot!). 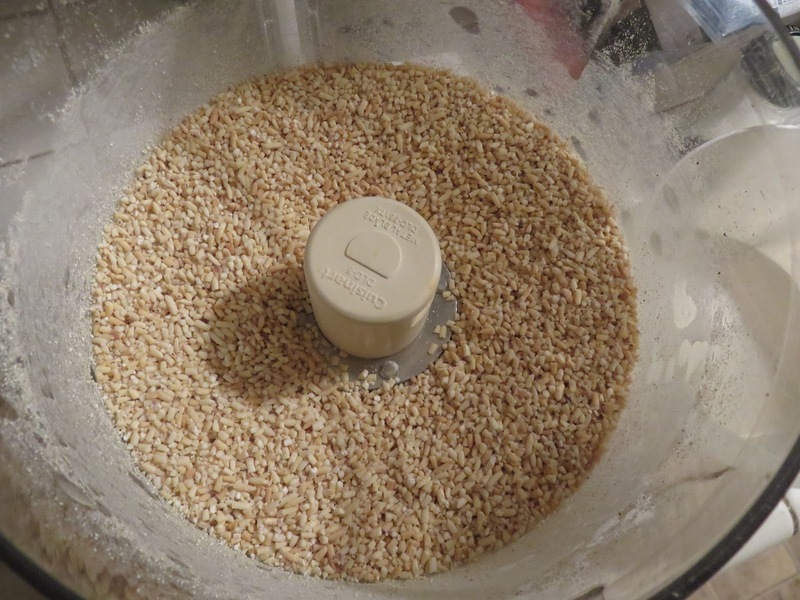 When it has cooled, place it in a food processor and pulse it until the rice is broken up into smaller bits (do not reduce it to powder!). 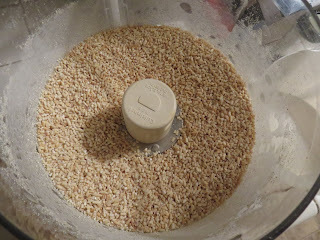 It comes out looking kind of like Irish steel-cut oatmeal (but if you don’t know what that looks like, that won’t help). 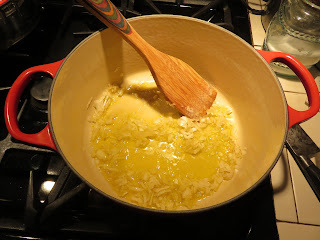 In a deep heavy pot or Dutch oven, heat the olive oil and the butter until the butter is melted. Add the chopped onion and cook slowly until it is translucent. Season it with salt and pepper. 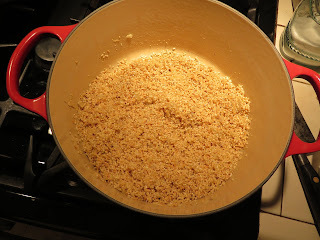 Add the toasted ground rice to the pot and stir until the rice and onion are well mixed. 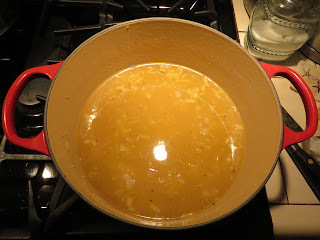 Add enough chicken stock to cover the mixture and cook over medium-low heat, stirring frequently, until the rice is cooked through. (Sounds like risotto, right?) You may need to add more chicken stock along the way, if the mixture becomes too dry before the rice is cooked, but don’t overdo it—you want the rice to be sticky, not soupy. I found this took about twenty minutes. And then let your imagination take over! It would be good alongside baked or braised chicken. Or toss in some left-over chicken or turkey pieces and heat through. Experiment! Different stocks, maybe? Add a chopped herb at the end? Despite the work and time involved in making it, I enjoyed the end product. The rice still retained a slightly crunchy texture, and it had a nice nutty flavor. 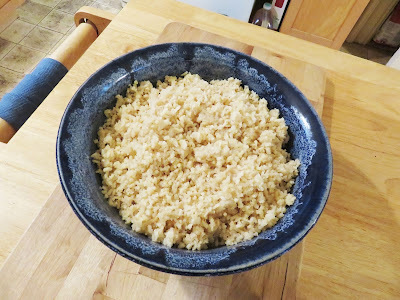 And this recipe makes plenty for left-overs, even though it started with only two cups of rice! It's fitting to be talking about Cruel Winter while there's a blizzard raging outside...because there's a blizzard in Cruel Winter. There's something kind of intimate about being trapped with both friends and strangers in a snowstorm--people may say unexpected things. And one of them might be a killer. Coming March 14th. 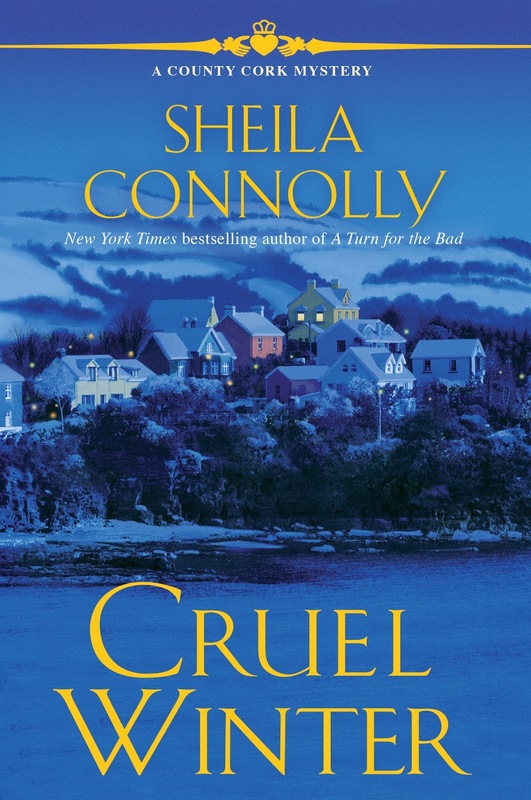 Available now at Amazon and Barnes and Noble (and still on sale for 1/3 off at both!). We have a lot of rice each week. Since my husband has a gluten allergy, rice is his go to side. He's in charge of making the rice. He's stuck on jasmine rice right now and putting things in it. Wears me out! I remember when we had to cook rice in a pot on the stove, and it never seemed to come out quite right. Instant rice was a blessing in those days. But then I discovered how to cook it in the microwave, which is pretty much foolproof. I know this recipe asks a lot of you, but if you've got time on your hands . . .
Good morning. This recipe appeals to me due to the nutty flavor that toasting the rice imparts. I do prefer a cooked rice over instant but both have their place. 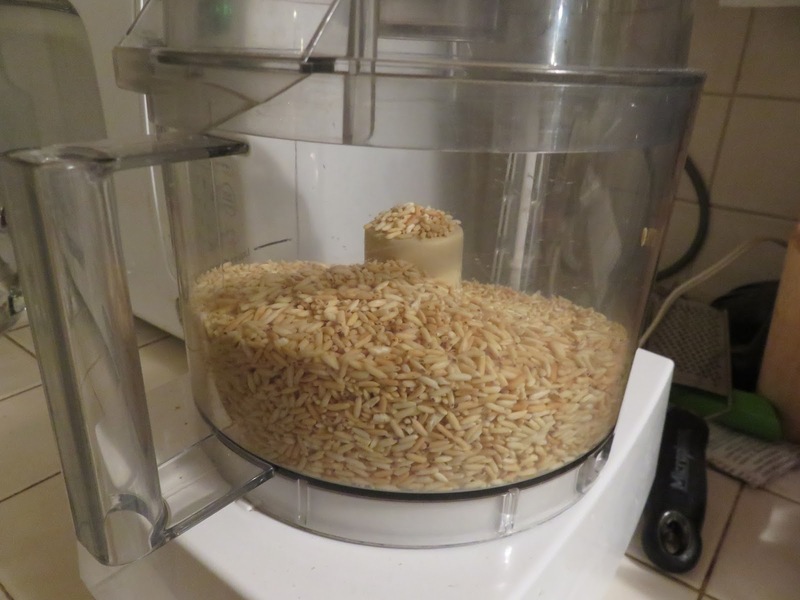 Our daughter and her family love their rice cooked in her rice cooker. Always perfect and quick and easy for a working mom of three!!! Thank you for the recipe. 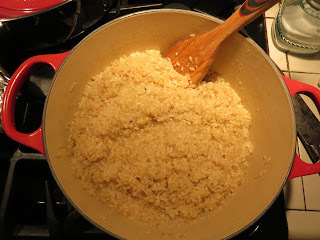 A toasted rice risotto! Looks yummy. We use a rice cooker, too -- Mr. Right got it when he was making a lot of sushi, and it's super easy. Nutty, chewy, and (I imagine) a bit creamy. Lovely post, Sheila. Must get some jasmine rice and enjoy the fun! I have toasted white rice before. Then I add onions and herbs. But I have never chopped it up. How very different!